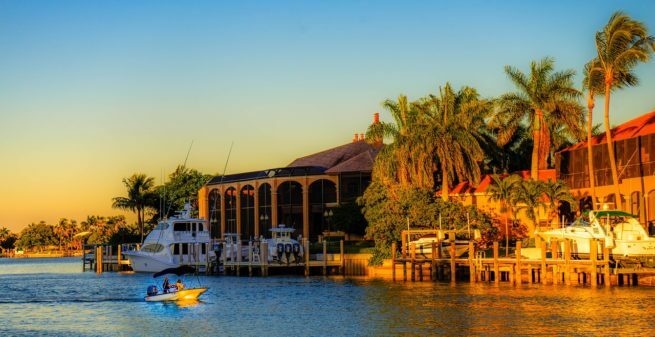 Fly private to Marco Island and experience one of Florida’s most loved locales for outdoor fun and luxury resorts. Private flyers in Florida often head to the Gulf Coast for relaxation and quiet; there’s something in the air around there that exudes a “no hurry” vibe, making relaxation easy. If you’re planning on relaxing, then waiting in line at a commercial port is not the way to do it. Let our team at Naples Jet Charter arrange your transportation, and you’ll be able to skip the lines and start your vacation early. Our private flight services are unmatched in the industry, as we employ the most stringent standards on aircraft maintenance, pilot choice, and booking flexibility. Our Wyvern certified jet charter representatives are available to assist you 24 hours a day and 7 days a week to ensure that your needs are met exactly when they need to be. Whether you’re booking a flight on a heavy jet or a light jet, there’s an airport in the area that can accommodate you, and we can help you pick the right one. Request a quote now or call to book your private flight to Marco Island, Florida. Charter a private flight to Marco Island with our private aviation company, and you’re sure to have your best flight experience yet. As the Gulf Coast’s biggest island, there’s plenty of room for luxury resorts. The most popular places to stay are the waterfront resorts, but there are also tons of guesthouses and villas that can be rented out. Choices range from mansions for a group to villas for a romantic getaway. Wherever you decide to stay in the area, you’re sure to enjoy yourself, but some of the lodging options are better than others. Our private aviation team has the knowledge and experience to develop the perfect itinerary no matter where you stay. However, with so many options of guest houses, resorts, and hotels, picking the right one can be a bit daunting. To help alleviate a bit of the decision making stress, our local brokers have listed some of the best places to stay in the area. Based on Marco Island Jet Charter client feedback, online reviews, amenities offered, and location, so there should be something on the list that can accommodate your needs. Rent a private jet for your next trip to the Gulf Coast, and enjoy some waterside relaxation on Marco Island. Most people visiting the area are going for the beaches, kayaking, fishing, and the Five Star resorts. We can fly you into (MKY) Marco Island Airport, which is only fifteen minutes outside of downtown, and arrange luxury ground transportation to your destination of choice. Their 5,000-foot runway can generally accommodate aircraft as large mid-sized jets. So whether you’ve gathered a group of friends and you want to kayak through the iconic Florida mangroves, or you and your significant other want to have a weekend exploring barrier islands by yacht charter, Marco Island is a great destination for your next private flight. After landing, our aviation team can arrange helicopter excursions to wherever you want to visit, as long as there is a nearby helipad. Tons of smaller barrier islands surround the area, making it one of Florida’s most popular destinations for a bit of kayaking. There are also tons of kayak companies that will give tours to see all of the best spots. Arrange a customized tour with their local representatives, and give yourself the opportunity to see the most picturesque and seldom visited spots in the Gulf. Whatever you decide to do, you’re sure to have a great time. However, there really are a lot of things to choose from, so figuring out the best attractions and most quality services can be a bit difficult. To help out a bit, our local aviation reps have compiled a list of the absolute best attractions in the area; read on to see the best attractions for after your private flight to Marco Island, Florida. One of the only non-developed barrier islands in Florida, this hidden gem is seldom visited by out of state visitors. Few outside of the area are aware of its existence, as it can only be reached by boat or kayak. With no roads or infrastructure of any kind, Keewaydin is the perfect spot for a quiet and relaxing daytrip. Naples Jet Charter utilizes the following airports to fly-clients privately to/from Marco Island, Florida and neighboring areas.